My family moved to India from Kuwait when I was just out of high school. At a confused end of teenage years, academic pressures and moving countries left me at very angry-at-the-world grumpy seventeen year old. To add to the pain, we were shifting to a town. A remote town. There was nothing much to do at first. No scratch that, there was nothing to do at all. Cousins, whom now I know where ticketed by Ammi came to hang out with me, often returned disappointed in my lack of interest to create a conversation. The only activity that felt remotely similar to my life in Kuwait was reading. I begged cousins to borrow books from the school library. I asked them to hunt down people who might have used books. Most of the books I gathered had been left unattended for years. I felt a terrible comfort in those yellowed pages, sniffing through the smell of old pages that sometimes would surprise me with the stale smell of dried roses. Days would pass into nights, and I would for all I can remember, sleep reading. Ammi was worried of course and tried hard to comfort me. She cooked my favourite meals, made us evening snacks which she knew I love with a cup of coffee and bought a whole lot of ice cream for desserts. When it all failed, she casually (as if she hadn't planned all this already) asked me if I would like to teach at the town school, since they have a teacher on leave and are looking for temporary replacement. She didn't wait for my reply. Technically, I was going to teach mathematics to tiny kids, but it turned out to be the most tremendously life changing, character building experience of my life (a story, I want to tell but can't find right words for it just yet), so much so that I continued to teach for next two years. It was first of many things and making first real friends was one of them. A vegetarian friend forced me to try malai koftas (cheese dumplings in creamy tomato sauce) despite my repeated plea about not liking paneer. I didn't end up loving it back then, until one day she made the koftas with bottle gourd instead. The melt in mouth vegetarian 'meat balls' were extra spicy dunked in a creamy tomato sauce that was pleasantly sweet. While some were soft and plump from cooking in the sauce, there were a side of crispy koftas as extras that the staff would enjoy during class breaks. I still continue that tradition by always making extra crispy koftas on the side,. Please note that considering the requests, I have started writing most of my recipes in metric measurement for consistent results but for most part you can adjust the measurements as most Indian cooks would. * this makes double the koftas than you would require but it is what the cook gets to eat for cooking and munching. Halve the recipe otherwise. Grate the zucchini and mix it with the rest of the ingredients for kofta. It might feel a little loose and sticky but once it hits the oil it will crisp up nicely. Fry them in batches until light golden brown. For the sauce, add oil in a pan and add the dry spices. Once they sizzle, add ginger and garlic paste, tomatoes and all powdered spices. Let the tomatoes cook down completely. Remove the cinnamon stick and bay leaf and blend rest of the ingredients in a blender until spoon. Mix in the coconut milk. Return the mixture to the pan, add 1/2 cup water and let it simmer at low flame for 10 minutes. Add the lime juice and mix well. 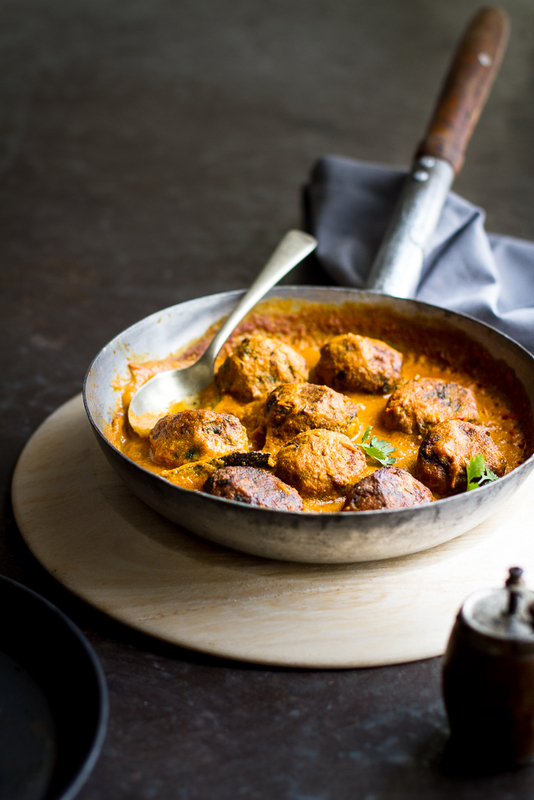 Line the koftas in the pan and lightly shake the pan to coat and move the sauce. Season with salt. Cook until the sauce is thick. The sauce gets thicker as it sits so if you plan to serve it later, add a splash of water and heat it before serving. We like it with some cumin rice with a side of simple onion salad but it is also great with flatbread like naan or pita bread too. A wonderful dish! Those vegetarian koftas sound amazing. Something I'd love to try soon. tomatoes and all powdered spices]. Soft and plump from cooking. I am in straight up love with these! So unique and totally yummy looking! I love the look of these. Just the kind of dish my meat-loving husband would happily eat without even missing the usual beef or lamb! My husband still prefers the meat ones though but then he doesn't even like mushrooms or much of any other vegetable so we should certainly not take his opinion into consideration. I am not cooking anything fun this week and your pictures are making me hungry at 11.00 in the morning. Loved the story, beautiful words. 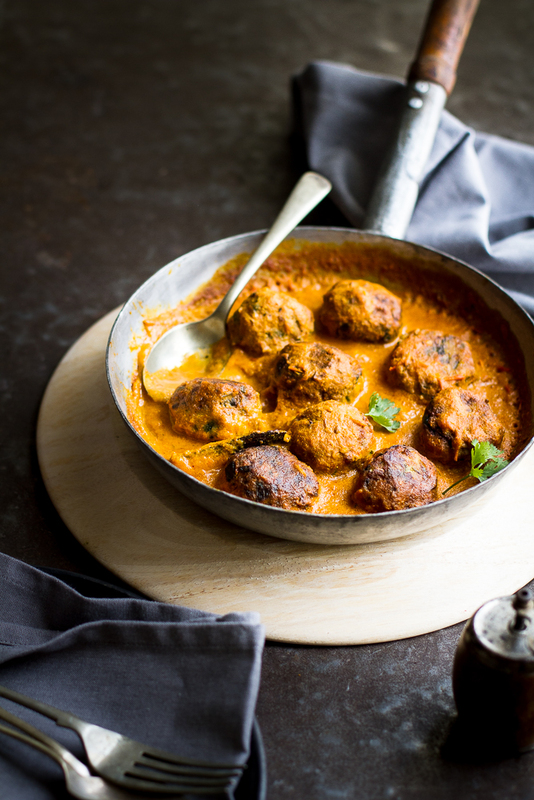 i like malai kofta but never had it with zucchini.. do you think i would bake the kofta? I tried baking these tonight and they turned out perfectly! I grated the potato as well, didn't boil first, and I added a little extra flour. Then I rolled balls of the mixture and dropped them into mini muffin trays, greased with a little olive oil, to hold their shape while baking. I baked them at about 220c until they were crispy (maybe 20-30 minutes?). Delicious! thank you! 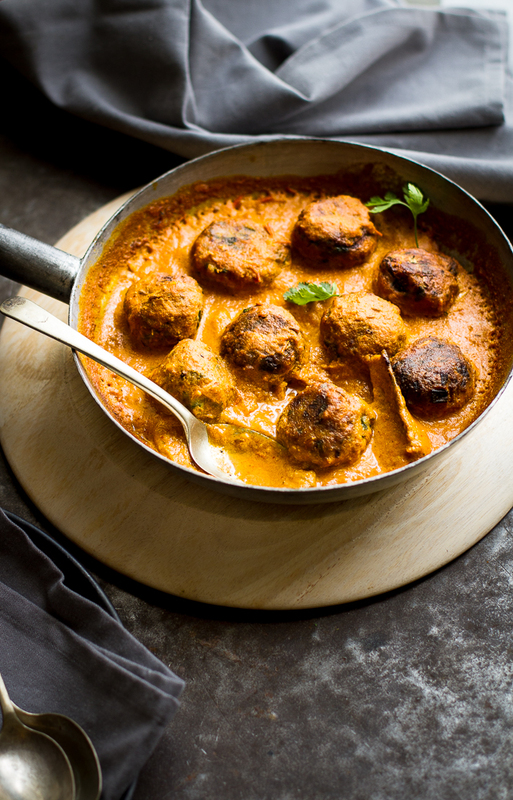 have you tried kofta with bottle gourd? You write beautifully Kulsum, I could feel your desolation and your mom's concern. Being a bookworm myself, I could also relate to your resorting to books as solace and refuge. I also make koftas with shredded cabbage and shrimp- delicious! And sometimes when I'm too tired or just feeling lazy, I just make this sweet tomato-coconut cream gravy and drop some large prawns and/or paneer cubes in it. Very tasty! No way Rashi, this blog is for conversation and sharing ideas. All your ideas sound terrific. I have tired similar recipe with shrimps and paneer but really intrigued by the raw banana and jackfruit. I haven't cooked much with raw bananas (a sabji or two and crispy deep fried) and want to try more. Hello, I try them it didn t work. I deep fried them it was Just big mess.so i put in more flour,still mess in the oil.so i baked it.any idea what could get wrong? hey there. So sorry it didn't work for you. Two things- make sure the potatoes have not been over boiled and absorbed a lot of water and/or the zucchini has too much water. In which case try adding more chickpeas flour until they form rounds easily. Also make sure the oil is hot (not super hot) when frying. I hope you give it a go again. should the potatoes be halved or mashed with the rest of the ingredients? there was no specification as to what to do after they are boiled. they seem a bit big to not have cut up for the mix? I have enjoyed reading your blog very much. Living in the USA I can easily have metric measuring cups and spoons at home, but seeing amounts for the vegetables only in metric will be way too time consuming. Our markets don't use metric although it would make life more simple for some of us if they did. Is it possible to put both, just for the ingredients that are store bought. like carrots or zucchini? I cooked this recipe last night for my girlfriend who is visiting from Germany. It was delicious. I followed the recipe exactly and it was perfect. The only change I made was to halve the ingredients and now I wish I hadn't as we would have been able to enjoy it all over again today. I'm going to make the quinoa salad as soon as my avocados ripen. Thank you so much, I look forward to lots more of your delicious vegetarian delights. you said it makes double the amount of kofta than you need. would you be able to elaborate on the serving size? if i halved the koftas recipe but did the sauce as is how many people would it feed? That is so beautiful and looks so delicious! I'll sure give it a try! This looks wonderful. I came across it on Pinterest. I do make zucchini koftas, but would never have thought of serving them in a spicy sauce like that. What have I been missing? It's a family favourite ;-) Try it! I stumbled on your words via Pinterest. The recipe sounds delectablel. I can't wait to make it and add it to my repertoire. Thank you. This recipe sounds really good. A 'print button' would be really useful as I can't haul my computer into the kitchen! Thanks for your feed back and I'm glad you want to make it again. The heat from the chilies of course is a personal preference. I want to cook this for my family, how many would it serve? Hi Alex, this could serve up to 3-4 people. I would definitely back up Genevieve's comment about grating and not over-boiling the potatoes! Currently having to try baking my kofta mix, as even after adding quite a bit more chickpea flour they're just not holding together. Maybe you could re-write this recipe with more specific instructions? I did find them a little sparse as I was working through them (should the potatoes be mashed or cut up into small pieces, how much oil should I be frying them in etc?) - and didn't check these comments until now, when the process is getting stressful! Would love to get this right though, as the pictures look so wonderful. You mixed up some of my favorite things in this post: exquisite writing, deep nostalgia and mouthwatering photos of an amazing flavorful veg dish! Be still my heart!! wonderful koftas..Never tried zucchini koftas. Will try this soon. Thanks for the wonderful recipe.. I made this and it was amazing! Thanks for the recipe. I tried baking them and it did not go well, fyi. Frying is much much better :-). I also added two tablespoons more chickpea flour, I think I didn't drain my zucchini enough. Came out fabulous! The dish came out amazing! 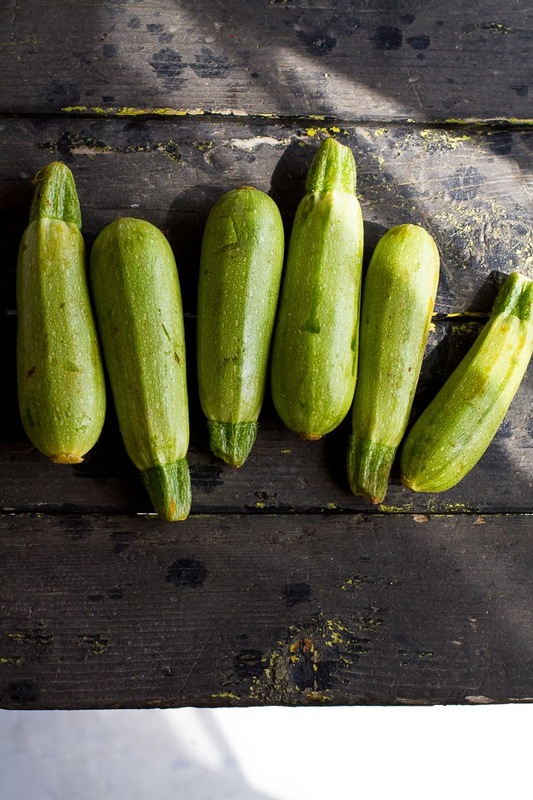 very excited to make these :) just one thing though--are those not grey squash in the picture, not zucchini? Have you made it with both? please let me know, thanks! How many zucchini? How many potatoes? should the potatoes be grated as well or mashed? also, should I strain the zucchini before mixing it in with the rest of the ingredients? help, please!